I am at the Southern Charm Restaurant in Blue Ridge, GA on my way to FantaSci in Raleigh, NC next weekend. It’s a lovely day to drive around Appalachia, sunny and comfortable. Comfortable is a good way to describe this year’s Gulf Wars weather. It was the best weather I’ve ever seen at Gulf Wars. We had major rain one night, but nothing huge during any day. It got warmish one day. There were a few days that got to the cool side of things, but nothing like the cold of the past few years. It was great. For the first time, I had my own booth at a major war. I was located across from the Gode Bakery along a major road, so I had people coming by my booth constantly. I was a little worried that my traffic would drop off dramatically by not being in Calontir Trim, but the location worked out well. The setup also worked well. I had my books and the CDs I carry on one side of the front. The other side held Lobster Rose Pottery. It was a nice combination, actually. Gwen’s stuff drew in some eyes my books didn’t, and vice versa. Overall, sales for me continued the trend of rising each year. I did real well on A Lake Most Deep, which is nice because I get a lot of return readers, so hopefully that means even more business next year. I was actually surprised how few sales with multiple items happened. Usually, I have about a third of my total sales from people buying two or more at once. This year, I only had about one in five or so. I’m not at all sure what that means, only that it was striking. CDs continue to add a touch extra. I broke even on CDs this year because I added Wolgemut’s latest and three of Vince Conaways. It’s a nice sideline that’s easy and continues to add a little here, a little there. I managed to fulfill my responsibilities as Their Majesties’ herald, though it wasn’t always easy. I caught the cold/cough/allergies that seemed to be going around and it slowed me down. I made it through court, if only barely, on Thursday. Then I fell down, go boom. Friday, I felt much better, though. I mentioned yesterday that I have a bunch of people to thank. I surely can’t remember everyone, because there’s so many, but here are some that come to mind. I’ll start with Master Andrixos for helping me along the path of SCA merchanting. He also brought over Master Blackhawk, merchant-o-crat of Ragnarok, Dagorhir’s version of Pennsic. I may go this year. Drix has been a major boon to me, and I can’t thank him enough. Seraphima, the Gulf Merchant coordinator, for putting up with my questions and helping me. I’ll also include her staff, who made things much easier. Thanks guys, I appreciate it. Gwen for making the pottery in the first place, but more importantly, Ulf for handling the pottery setup and take down. Thanks very much. I didn’t break anything, which was a huge concern on my part. I learned how hard it is to run a booth by oneself. Thanks to Kierstie and Catin for taking time out of their schedules to watch the booth. Also to Nest and Dissa, who dropped by a number of times to see if I needed anything. There were also a number of people who hung around for five minutes while I went to the bathroom or across the street to the Gode Bakery. Thanks guys, I couldn’t have made it through the war without you. I want to thank Their Majesties for being patient and accommodating with my work schedule. They adapted and overcame when I wasn’t around as things changed and they needed a herald on the spur of the moment. Also, I really appreciate you allowing me to tag in Dawi to serve as stunt herald for opening ceremonies. And guess what, I’d like to thank Dawi for handling opening ceremonies. It’s a fun gig, but it’s a lot of hurry up and wait, and by doing the job, it meant I had that much more time to work. To count off on the final results. I liked my location. I sold more than ever. Gwen liked the results. I learned a ton about what I need in my own booth, too. If they let me, I’ll be right there again next year. Wow, I just realized I never actually posted this on Friday when I had it ready to go. My apologies, I was waiting on an email from ACX confirming the exciting news. You get two updates this week. What exciting news, you ask? Well, the Audible version of A Lake Most Deep went to Audible for proofing today. For a variety of reasons, it has taken much longer than expected, but it’s just about ready to go. It’ll be live as soon as Audible reviews it and I’ll be posting it. Fair warning, I’ll probably post a special announcement here when that happens. My voice actor is Rob Saladino. His IMDB page is here: https://www.imdb.com/name/nm5238545/. There’s not a ton there now, but he’s plugging away and he’s got some interesting projects coming along. This has been another productive week, though I slowed some to consolidate some of the writing. Plus, of course, there was ChattaCon. Still, I’m making significant progress at around 70k. And that’s what I’m going to go work on right now. The Mountain of Power Processional from the Conan the Barbarian soundtrack. This soundtrack is amazing. Basil Poledouris did an amazing job, and, frankly wrote music to emphasize heroism. It’s great writing music. Since I’m listening to the soundtrack, let’s start with the words that start the film. This quote concludes with my aim as a writer. Not a great week for me on the blog front. I doubt I’ll do much on that this week either as I am really pushing on A Feeding of Sorrows. I might have a couple more to add, one the first weekend of March and one in April, but still figuring out details. This week’s spotlight is on Jason Cordova because I found Rob Saladino because he did the audiobook version of Jason’s book. Wraithkin, by I really enjoyed the book and the narration so I was excited when he agreed to narrate my books. He also is a part of the Four Horsemen Universe, and he’s got a bunch of good stuff out there. This week’s interview is with Jesse Oak Rise, an author and videographer I met in Pittsburgh last year when I went to Confluence during the middle of Pennsic. I was struck in our conversations about how much they have studied technical details of making videos, something I know very little about and Jesse taught me about. Presently I run a blog dealing with topics surrounding the trans and non-binary community, mental health, and Crohn’s Disease. In the future I have several plans for my YouTube channel, The Knighted Nerd, which are creating video reviews of trans related media as well as video game content through a trans perspective. This would include Let’s Plays of various games. Interviews with trans and non-binary community leaders. Hopefully gain interviews with politicians and political leaders. Attend trans and mental health related conferences and, hopefully, document them. I wouldn’t say I have success. My influences, however, are as follows: Lyndsey Sickler, educator and advocate, among other things. Created and runs TransPride Pittsburgh. The late Nancy Evelyn Gold, who inspired me in the first place to learn Adobe Premiere Pro / Final Cut. Anthony Q. Artis, author of The Shut Up and Shoot Freelance Video Guide and The Shut Up and Shoot Documentary Guide, Voice-Over Voice Actor: What It’s Like Behind the Mic by Yuri Lowenthal and Tara Platt, The Art of Voice Acting: The Craft and Business of Performing for Voiceover by James Alburger. I’m, by no means, a professional videographer, voice actor, or YouTuber. What I am is a person that has worn many hats. No matter which of these you do or want to do the biggest lessons I’ve learned in all three are: Make sure your audio is on point. No $10 microphones. Go for a Blue Snowball or Yeti. If you want to go XLR, go for Rode Mic with a usb interface. Make sure you’re audio is shielded in some way, even if you have to build makeshift plywood walls to stick soundproofing on, it’s better than having anything under or over your voice. Video, depending how you want to do it, look for either a quality web cam or a camcorder. If you got the bucks, look into getting a DSLR camera. Look into 3 or 4 point lighting. This will bring your video game up a notch. If you’re going to do green screen, YouTube and your local library are your friend to learn. These are how I have learned everything I know now. What do you mean? African or European paint brush? The biggest challenge I have has plagued me all my life: money. I don’t have the funds to do the things I want to do the things I mentioned above, much to my dismay. I’ve been taught all my life that I’ll never amount to anything. Over the last two and ½ decades I’ve learned that I have an innate ability to quickly learn almost any skill quickly. With this tool I know I could succeed at almost anything, if given the opportunity. Favorite Sports Team? What’s a sports? Favorite Musical Performer We’ve Never Heard Of? Myself, Jesse Oak Rise. Favorite Pet? Can I own Death as a pet? Have you thought about adding authentic transgender characters in your writings? My Answer: Thought about it, yes? Done it? No, because it’s never been relevant to the story I’m telling. Given that I write hack and slash, swords and sorcery action novels, I generally focus on whether my characters are strong, smart, fast, tough, or wise because those things matter in a fight. Rarely does plumbing of any type affect the outcome of a fight or a story, so I don’t talk about it much. It all boils down to what makes a good story. If a character being transgender makes a better story, I’ll make that happen in a heartbeat. If it doesn’t, I already try to strip everything I can in my writing that doesn’t push the story along. I had a great time at ConQuest last weekend. Met some cool people, sold a few books, learned some things. Good stuff. My complete AAR is here: http://robhowell.org/blog/?p=1142. The first edited copies of Brief Is My Flame are starting to come in. I’m truly humbled by all the work my Advance Reader Team is doing for me. Thanks for helping me make a better book. It’s clear to me that I’m getting more skilled at the technical aspects of writing. I have dramatically reduced certain mistakes that I commonly made in A Lake Most Deep. I still have a long way to go, of course, but it’s progress. I may not be designing better furniture and it may not have fantastic decoration, but at least I’m building the items better than ever. This weekend is Wichicon, a small con held as part of Wichita’s Riverfest. I don’t that it will be a great selling con, but Wichita is home and it’s a chance to see Mom. Today, I’ll start going through some of the edits, though next week will be when I start focusing on that. I’ve also started the short story for the next 4HU anthology. I’m in the throw words at the page and wait for me to make some sort of connection that actually turns into a story. “Piano Man” by Billy Joel. I know it’s overplayed, but I really appreciate the line “they’re sharing a drink called loneliness.” I’ve been there often enough. Today is Walt Whitman’s birthday, so this quote seems obvious to me. He was so good with evocative language. We remember this part of Song of Myself mostly because of the “barbaric yawp” and perhaps Robin Williams in Dead Poet Society, but here’s more just to give the ‘yawp’ its context. This week’s spotlight is on Gray Rinehart, a talented musician, editor, and writer. You can find my interview of him at: http://robhowell.org/blog/?p=1145 and his website is: http://graymanwrites.com. What an eventful week so far! First, I’ve added those who signed up at Pennsic. Many thanks for all who talked to me there, and I am already looking forward to Pennsic 47. Welcome to my weekly slice of Robness. 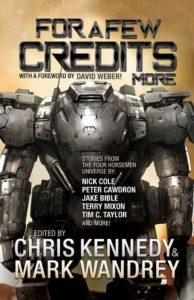 The biggest news is that one of the short stories I’ve been mentioning for a while was just accepted to be part of the For a Few Credits More, the second anthology in the Four Horsemen Universe. The 4HU is one where humanity is one of hundreds of alien races living a loose arrangement whose sole goal is to ensure that the overall peace is maintained. Within that, however, are all sorts of smaller conflicts involving mercenaries, and the universe centers around these mercs fighting in a Byzantine universe of plotting and treachery. 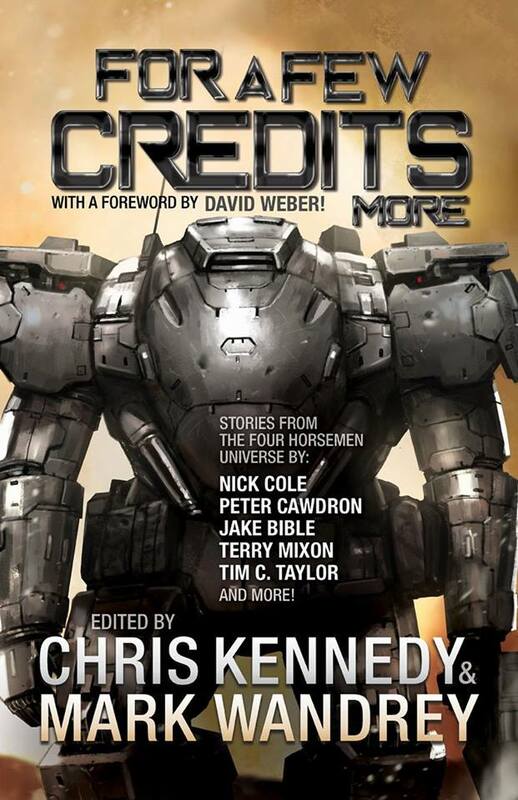 Cover for the Four Horsemen anthology For a Few Credits More. I’ve never been more excited to be called “AND MORE” in my life. But that’s not the only exciting thing going on here. Rob Saladino will begin recording A Lake Most Deep in audiobook form starting around 1 September. He’ll be doing my other Shijuren novels soon after, too. I don’t yet have any clue when actual release dates will be, because it takes time to do all of this well, but they are a-comin’. In less productive news, because of my travel schedule, the move, and recovery from Pennsic, I’ve not done much other than lie in bed and contemplate bad things happening to my characters in Brief Is My Flame. I’m just going to say that I think my characters would prefer me to sit and write than lie and plot, because I’m much nastier to them in the middle of the night snuggled in my bed with my cat sitting on my head than I am typing on my laptop. Far nastier. This week’s quote sort of encapsulates my writing philosophy. I write about people, and whether they are wizards or use fusion-powered starships or wear powered armor, stories are about people. – Ernest J. King, as quoted in the prologue (page viii) of his memoirs, Fleet Admiral King: A Naval Record (1952). This week’s Spotlight is on Rob Saladino , who is recording my audiobooks. His IMDB page is here: http://www.imdb.com/name/nm5238545/ and his Facebook page is here: https://www.facebook.com/thehumblereview. If you go there, you’ll see he recently recorded a biography about Prince. I suspect this is the closest I’ll ever get to Prince. Been a busy weekend here in Rob-ville, though much of the work was done weeks ago. In honor of the release of Where Now the Rider, the e-book version of A Lake Most Deep is free on Amazon starting tomorrow and running all week long. If you have been wanting to tell your friends about my books, now’s the perfect time. If you want to hear about my writing philosophies, you can check out Write Pack Radio today. This week’s podcast talks about Plutarch and Writing Non-Fiction. I’ll also be featured next week when we talk about working with an editor. For me, I’ve spent this weekend packing and plotting several things. Bwa ha, bwa ha ha. The last few days, I’ve been in final preproduction mode for Where Now the Rider. Right now, I’m close to complete because I had a very productive weekend. At Comicon I mentioned that was my plan and someone I talked to asked what I meant, so I thought I’d write a blog post for what I do. It’s easy to say that preproduction is doing all the things that turn a manuscript into a publishable novel, but what does that entail. Here’s a sort of checklist for me. Create a title page and colophon. This is the basic stuff that says who is involved in the copyright, like the artists and editors, and the normal copyright disclaimers. This page is in every book, so this part is easy for me as I have one written already and I cut and paste, changing the relevant information. ISBN Numbers: I assign an ISBN three numbers to each book, one for the electronic version, paperback version, and audiobook version. I don’t necessarily have to assign one to the electronic version, but I think there’s an advantage and since I buy the numbers in bulk, it costs me very little. In any case, this is generally a tedious but fairly quick process. I then add these numbers to the colophon. Dedication and Foreword. I often do these ahead of time when I feel motivated. They need editing, after all, though I’ll admit I don’t worry about editing these as much as I do the text. Double-check the map. Make sure it’s only 300dpi and fits in the space. At this point, it’s a standard thing and all I’m doing is making sure nothing’s gone wrong. Adding the people, places, and glossary. This is the longest part of preproduction. I could cut a bunch of hours if I didn’t do this, however, I think it’s important to make things easier for my readers. Also, I find it extremely helpful to me to keep the online wiki at www.shijuren.org updated. I’ve done many of the entries while I’m writing the book, but this makes sure I haven’t missed any. I’ll discuss this section more in a moment. Adding the world-building appendices: the calendar, magic, and religion of Shijuren. These are written and I think they’re pretty good as the stand, so this is just cut and paste right now. Adding extra pages. I’ve discovered that if I need to make an edit, I want to have some extra pages at the end. Not many, say 5-6. However, when Patrick McEvoy makes the cover, he has to know how many pages wide to make the spine. This is tricky. If I add any pages, he has to make the spine wider. Rather than risk this, I add some ahead of time so if I need to make an addition to the book at the next printing, I can do so without bothering him. What if, for example, I want to put a snippet of Edward, Book IV in the end? I’ve started adding a snippet of the book immediately following to A Lake Most Deep and The Eyes of a Doll, by the way. Cover blurb. I hate this part. How can it be so hard to write a cover blurb when you have written a 100k-word novel? For whatever reason, this is incredibly difficult to me. I suppose I’m getting better, but it’s still tough. Double-check all the other cover items. this really isn’t much, actually, since we’ve done this before. I like my author description so I’m not changing it right now. Look for orphans. Theoretically, Word is supposed to do that, however, I’ve seen a few of them appear. It’s less of a problem since I started writing in the format I end up printing in (6×9, half-inch margins plus an extra half in for gutter, Garamond 12pt font). If I find any, I see if I can cut a line or two somewhere in the chapter. Usually I can. The last, absolute last, thing is creating a Table of Contents. Fortunately, Word does most of the work for me however if you make any changes to the text that might add or subtract a page messes things up. I do it last, then clean it up a little to look like how I want it. That’s basically it. There’s probably more I’m not thinking of right now, but that’ll do except for more on the people, places, glossary, and wiki. I enjoy working on the wiki. It’s usually a relaxing way to spend time because worldbuilding is my favorite part of this. Part of the adding the list of people and places is to add links to the main copy of the text. I always work with what will be the electronic copy as shifting to a print version is much easier than vice versa. Thank you, CTRL-SHIFT-F9, which removes every hyperlink in a selection, when combined with CTRL-A, I can eliminate all the hyperlinks in two keystrokes. The print version does not need them, after all. Anyway, I get the electronic version done and updated, mashing every mistake I can find. I then upload it to Amazon. Only then do I convert to the print version and send to CreateSpace. And that’s it. It’s a lot of detail work that takes me days because I need to be focused for it to work, and of course I still make mistakes. Fewer now than when I started, though. Now it’s time for me to go write that blurb. I’m mostly recovered from a great weekend at KC Planet Comicon. It’s an exhausting weekend, of course, but it’s a great chance to meet people and see all sorts of cool stuff. The con does a number of things well. First, they’re not overpriced. It *is* possible for Artist Alley types to break even and make money. There are lots of cons where that’s not the case. I like the time we have to set up. The big vendors and exhibits can start setting up on Wednesday. I personally went in early on Thursday. The con actually starts on Friday at noon, and smaller vendors like myself can even set up on Friday morning, if needed. Also, I like that they had so many volunteers and they did a good job of making those volunteers available to us. The only truly bad experience I had was the parking, and I was fortunate. Parking around Bartle Hall is tough, and I’m happy to pay $75 for one of the dock spots. I parked on the West Dock, which is really convenient for me. The problem was their system of purchasing. When I got there Thursday morning, I was told specifically that if I wanted a West Dock spot they would go on sale at 5pm. Fair enough. Except they went on sale earlier than that. I got mine at 4:30pm, and I think mine was the last one. I bet there were a number of livid people who followed the rules and got screwed. I know I almost was. I passed that upchannel because that’s an awful yet avoidable customer fail. Comicon was bigger than ever, I think. I know I spent an hour before hand on Saturday walking around and I did not see it all. Food choices were also better than ever. They didn’t simply have the normal hot dog and nacho choices, but several food trucks parked in one end. Also, there was a service that would deliver food to our booths for vendors, however, they only offered carb-heavy choices so I didn’t have anything. I almost tempted Giulia into the 96-ounce Roasterie coffee, though. They also offered a number of perks to those with exhibitor badges. Apparently, they also worked as fast pass badges in lines for celebrities or food. In general, I would have to say Planet Comicons are great for vendors. I had a goodly amount of traffic throughout the weekend. Friday afternoon was slow, but that’s to be expected. Saturday and Sunday were hopping, though, and I got lots of names for my mailing list as well as enough sales to break even. More than good enough. My aisle also benefited from having Timothy Zahn across from me. He was very gracious and patient. I actually brought my first edition Blackcollar and Backlash Mission books which Dad bought used a loooong time ago. He enjoyed seeing the copies, and we both had a chuckle at the combined $3.50 Dad paid for those. I also got a chance to reminisce about the Green Dragon, which was such an important place for me growing up. I tried something new this year. Last year, a number of people admired my cover art so I printed off 12 each 8x10s of the covers from A Lake Most Deep, The Eyes of a Doll, and Where Now the Rider. As a side note, I ordered Monday night, they were shipped on Tuesday, and I got them on Wednesday. MPix did a great job. Anyway, I only sold 3 prints, though I gave away another to a good customer. I think I marketed them incorrectly. First, I think people would have paid more than $12 if they were larger, like 11×17. Second, I offered the same kind of deal as I do with my books: Buy one, get a discounted price for any others. I think a better way to market them will be $12, $9 if you show me your Kindle where you purchased one of my ebooks. That could be a good way to offer the 8x10s. I’m still contemplating the postcard idea, but this will do for now, I think. I really wish I had had Where Now the Rider done. Selling a set of 3 would have been a great option for me. It’ll be there next time, though and I’m discovering that books happen on their own schedule, to a certain extent. My other regret is not getting on panels again this year. Totally slipped my mind. I’ll not let that happen next year. All in all, though, it was a great weekend and I look forward to doing it again next year. Here’s another annotated snippet. It picks up where the first snippet, which you can find at http://robhowell.org/blog/?p=56 concludes. As before, I’ll add occasional annotations indented and italicized. I followed her to a long, low, rambling building running along a ridge around Achrida. It served as the primary home of the Mrnjavcevic family, the leading clan of the Dassaretae, one of the two tribes that had squabbled for control of Achrida for centuries. The Dassaretae was an actual tribe in the Balkans. It’s not a particularly well-known one, though, and it seemed a cool name so I chose it as one of the tribes. The same goes for the Mrnjavcevic family. Even though I’m writing fantasy novels, I love researching history too much to not steal fun names and places. The old woman who guarded the door had never liked me. The look on her face made it clear I remained unworthy to sully her honored halls, but she allowed me to enter without comment. Vukasin had probably told her to expect me. She led us through the labyrinth of rooms and hallways. This exchange is a bit of foreshadowing that becomes important later in the book. Readers of Where Now the Rider will see where it comes into play. Piri gave me a sly smile, but otherwise ignored me. Eventually we reached and the polished oak door that led to Vukasin’s sitting room and office. The grim doorwarden, knocked and opened the door at his response, not quite lifting her nose up at me. Not quite. Vukasin sat at his desk, his hands full of various papers. He was a short man, but wide and powerful. His eyes were the color of basalt, which seemed appropriate to me, as he was as strong and deliberate as the mountains. The Zupan of the Dassaretae needed such strength, I guessed. The historical Vukasin Mrnjavcevic was a general and later the military governor of a part of modern Macedonia. Interestingly, Marko Mrnjavcevic, his son, becomes the Prince Marko of Serbian legend that I refer to often in these novels. Zupan is an another historical term. An easy place to use something different besides leader or ruler. “You’re welcome. Maja, pour us some water.” He waved at the chairs before his desk. Piri and I sat while Maja went to a sideboard and poured goblets of cold lakewater sweetened with pomegranate. I took a sip before beginning. There’s a scene in A Lake Most Deep where Svetislav rows Edward out into the lake to discuss the Gropa Council. In that scene, Svetislav handed Edward a mug to dip lakewater out to drink. That actually happened to me in Ohrid. I took a short boat cruise into the lake and the captain handed out a couple of cheap mugs for us to drink from the lake. It was, in fact, delicious, and that’s why I make such a point of it in these novels. “I suspected that was the case.” Vukasin’s nostrils flared, but otherwise, he expressed no emotion at the news that his lord had betrayed him. Obviously, this is my way of summing up The Eyes of a Doll. I hate exposition, and in some ways it’s not relevant to Where Now the Rider, however, it’s part of Edward’s character development, which I touch upon in the following paragraph. In my homeland, thegns would have flocked to his banner to avenge that betrayal. My mind filled with memories of looking across the field at thegns who had done just that for Cynric when his son, Penwulf, my lord, had betrayed him. My father had fought under Cynric’s banner on that day, and I had killed him. Vukasin cleared his throat and I returned to the moment. “He wanted a war between Ylli of Lezh and Gibroz so that you could not have a base of power against him,” I said. More foreshadowing, in a way. Let me just say I’m perfectly willing for you all to remember the Emperor’s paranoia. It could be a reoccurring theme. Could be. The Gropa and Enchelei are, like the Mrnjavcevics and Dassaretae, historical. We sat with our memories for a moment. “Welcome to the Empire.” Piri’s face bore that sardonic smile again. “And today I think I know everything,” Vukasin said as he leaned back. “We just watched them leave before coming here,” added Piri. “So now what?” Vukasin stared at me. This is an example of the synergy of writing I Am a Wondrous Thing. I actually really like these paragraphs. It lets me build a whole world around Achrida while still being focused on Edward. It’s also an example of serendipity. When I started writing Wondrous Thing I had no intention of putting Edward into it. Then I realized I had already done so in A Lake Most Deep and he had to make a cameo. Even though I didn’t intend it, his appearance strengthens these Edward books. Another note about Edward in Wondrous Thing. I actually struggled to write his part because I kept putting myself too much into his head, especially since I did not want him a POV character. Vukasin rested his dark eyes on me without saying anything. I watched dust float through a sunbeam sneaking through Vukasin’s shuttered window. Piri made no motion. I intend for the Adventures of Edward Aethelredson to be a recurring series where readers don’t have to have read the earlier books to enjoy the story. And in general, I think I succeeded. However, there’s no doubt that these first three are tied together for the reason that I detailed in the last snippet. Taken together, they will make Achrida Edward’s home.